The company N.A.M.E. Ltd based in Limassol represents exclusively the global chain stores of NO NAME in Cyprus since 1996. The very first NO NAME shop in Cyprus is still operating at Themidos & Tositsas near Anexartisias street in Limassol offering the latest trends in men’s clothing since 1996. A year later and more specifically in April 1997 the company took a step further with a very optimistic at those days expansion plan. The second shop at 35th Nikodimou Mylona street in Paphos was a fact; followed in 2001 by Larnaca with the first Male/Female shop. After all this success and taking in consideration the big demand for NO NAME, the company managed to present the first shop in Nicosia the capital city of Cyprus. The shop can be found at the most popular high street of the town at Stasikratous street. This leaded to our existence in the major cities all over Cyprus and became a distinguished brand in the world of fashion and modern Lifestyle in Cyprus. After operating in the industry of fashion a full decade and successfully manage to assemble a franchise chain all over the island that was not the end. 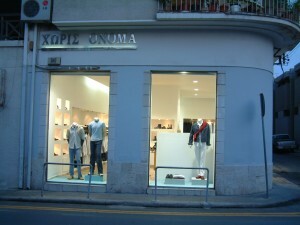 In 2008 the company proudly presented the most amazing NO NAME shop in Cyprus, a two floor premises at 125, Arch. Makariou Avenue introducing both collections for Men & Women and also housing the head office of the company. An important factor for the company’s success was the consistence of NO NAME by always offering a large cloth collection for men and women. The modern stylish shops in all major towns of Cyprus communicate the status of brand in the industry of fashion as well as the company’s class. The style and culture of NO NAME along with top quality conveys a modern lifestyle which every fashionista wishes to adobe. All designs are in-house to ensure that our products have a unique appeal on the high street. The concept of NO NAME clothes satisfies all personal styles for all occasions, having casual clothes for a daily basis to smart outfits for any special event. A complete collection of shoes and different accessories for men and women for the final touch is also presented to all shops. The company’s working environment is responsive and fast moving. We are achievement orientated and driven to provide the latest trends. Our well trained staff guides all customers and visitors to find their fashion mix and ensure that they leave our stores with a memorable purchasing experience.